Nowadays, people can easily find different forms of entertainment online. Watching movies, videos, listening to the music can easily replace reading books, magazines and comic books. At present, comic books suffer the most, as they can easily be found online and there is no need for readers to leave their homes to go to the store and spend money for things they can get for free. Nevertheless, writing comics still remains one of the most popular tasks among many people. Why is it so? The answer is simple; many individuals want to escape from the reality of the world they are living in by engaging in comic books reading. Numerous, so-called, escapists find this way of spending time interesting and quite exciting. However, comic book writing can become even more exciting than reading it. If you want to know how to write a comic book or learn more about comic book script format, our article will be helpful! If you do not know how to write a comic but you really want to try, follow the steps described below. 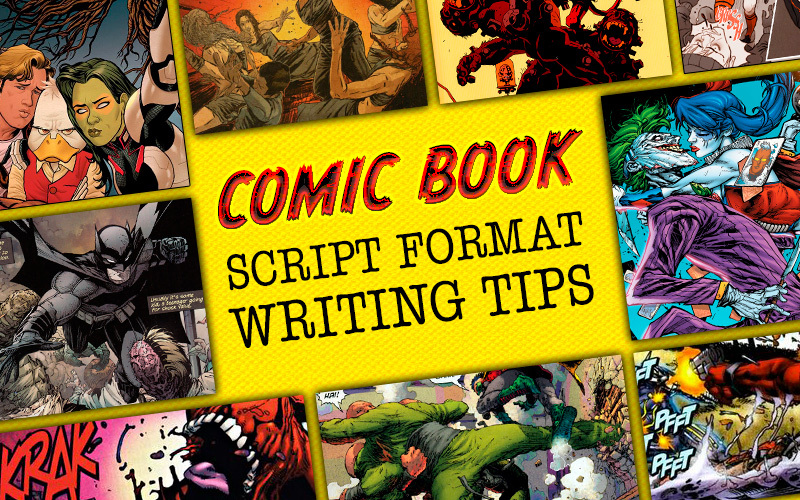 Our comic book writing tips will show you where to start. What the comic is going to be about? Who are the main characters and what are they going to do? Every story, whether it is a novel or just a comic, is based on some event and some characters. People, creatures, etc. you describe in your comic book will form a core of your story. That is why it is extremely important to pay particular attention to them. Remember that readers will not necessarily remember the plot of your book or some background details. The only thing they may memorize is your character. Do you know what the first book in the series of comics about Batman is about? Probably not. However, everyone knows who Batman is. Just like that, you should create a memorable character who will be bright and interesting enough to remember. Besides, you should work on the dialogs and monologs to give your character temper and to make people better understand whom they are dealing with. As an example, you can take any comic book character outline and see what makes him/her/it special. However, make sure you do not duplicate anything. No one is interested in one more Superman. Specific feature of comic writing is that it requires drawing. It is not only about writing a good plot but also about visual presentation of your heroes. If you do not know how to become a comic book writer, you should remember that it requires two components: writing and drawing skills. Sure, you can involve a good artist to help you but you will need to make him/her interested enough to start working with you. Still, do not upset, if your character seems a bit silly at first. Even professionals try different prototypes before they come up with a single image of a main character. In order to write a really fascinating comic book, you should know how to write a comic book script. It is not as simple as it may seem. Sure, you can find tons of information on how to write comics online but much of it can confuse you. If you choose to follow out outline, the next step will be to create a plot of your story. In other words, you will have to think about what to do with your characters. One interesting thing about writing a comic book is that you should now start if you do not know how the story is going to end! Just think about it. If you know the ending, it will be easier for you to bring your characters there. Moreover, it will be easier for you to create a reasonable chronology and write logical informative and interesting dialogues. So, try to start your story with creating its ending. The other tip regarding comic book plot is that you have to think about a storyline, which will be understandable without much text in it. Do not forget that comics are mostly about watching then reading. To reach success in comic script writing, the characters should also be placed in specific timeframes and location. This method will have you to stay focused and will also make it easier for you to create a background of the story. You will not be drawing castles if the events of your story occur at present times in, let us say, New York. You can look for comic book scripts for artists online to understand the specific of this genre better. Still, the thing to remember is that every step described above will lead you to creation of an interesting plot with memorable characters. Format of a comic book is one of its most essential parts. If you have created an interesting character and managed to come up with a fascinating timeline, it does not mean that you can sit and write a comic book right away. The deal is that every comic book requires following a specific format. Marvel Studio is one of the most professional studios in relation to comic books creation. So, if you want to know how to write a comic book outline, you should definitely check on marvel comic book sample scripts. They will give you understanding not only of format but also of how to create without exaggeration outstanding heroes and stories. The most important thing is not to turn your comic into a novel with illustrations. If you see that writing is what makes most of your story, maybe you should try writing a novel instead of a comic book? Comic book writing requires mastering of its script format. Only if you know how to present your ideas properly, you will be able to come up with something worthy. The difficulty of a script format is in that; the text you write should express not only what the character speaks but also how it is done. For example, small-size letters will stand for whispering, while capital letter can express screaming. Text in dialog panel will represent actual talking, while the text outside of it can show what the character thinks about or represent some general background information. It is also important to remember that the dialog panels should have prefixes so the reader could distinguish who says what on a picture. Yes, do not forget that you will also need to learn how to represent sound visually! The basics described in this article will help you to make your first steps towards becoming a great comic writer!